Kew Gardens | How does it work? Learn more about the Adopt a seed, Save a species campaign. The Millennium Seed Bank Partnership (MSBP) is a project of the Royal Botanic Gardens, Kew. The money given to the Adopt a Seed programme will go to the MSBP to help with the seed sourcing, collecting, storage and research that is undertaken as part of this programme. If you choose to save a species, your donation represents the cost to the project of collecting and banking a seed species. Gift Aid makes your support go even further; if you are a UK taxpayer, the Gift Aid Scheme allows us to reclaim a further 25p on every £1 you give us. This really boosts our income - and doesn't cost you a single penny extra. Please tick the gift aid declaration box at check out if you are happy for us to reclaim Gift Aid on your behalf. Kew is an exempt charity and a third of its income is generated by donations (the other thirds are made up of commercial activities and government funding). Kew’s scientific vision is to document and understand global plant and fungal diversity and its uses, bringing its expertise to the critical challenges facing humanity today such as food security, health, biodiversity loss and climate change. It does this in two main ways; 1) by sourcing, curating and storing plants and fungi from all over the world and 2) by conducting research into these specimens to understand, document and share knowledge on some of the biggest issues facing our planet. The core purpose of Kew’s science stems from a simple but often overlooked truth: all our lives depend on plants. What is the Millennium Seed Bank (MSB) and the Millennium Seed Bank Partnership (MSBP)? The MSB is a high-tech building on Kew’s site at Wakehurst that has been specially designed for the long-term storage of seeds of wild species for research and conservation. It has the capacity to house around 75% of the world’s storable seeds. The building is energy efficient with solar panels on the roof providing the electricity needed for seed storage. It is also flood-proof, bomb-proof and radiation-proof. The building has three glass sections that house laboratories, seed-preparation facilities and a public exhibition area. Under these lie a vast storage vault where the seeds are stored at -20C. As the seeds are considered viable (that is they are alive) the MSB building is considered the most biodiverse spot on Earth! The great majority of this MSB collection has been collected by the associated global network, the MSBP, which is active in over 80 countries and is the largest ex situ plant conservation programme in the world. The MSBP has 150 partnership agreements with institutions covering 95 countries. Why is it important to bank seeds? By storing the world's seeds, the MSB aims to provide an insurance policy against the extinction of plants in the wild. This is important because plants provide food, building materials, fibres for clothing, medicines and fuel, but also it is important for preserving our global botanical heritage for future generations. The destruction of plant habitats is happening so fast that it is not always possible to conserve plants within threatened habitats although that would be ideal. Collecting seeds and preserving them ex situ (away from their natural habitat) offers an economical and effective way to save seeds and keep them for posterity. In the future, if required, they can be germinated and reintroduced to the wild or used in scientific research. What is the process of seed banking? Following the collection of seeds in-country (around 92% of seeds are collected from wild plant populations), seeds are checked in upon arrival at the MSB and then dried to around 4–6% moisture content. After this they are cleaned to remove any bits of plant, damaged and empty seeds then an x-ray on a small sample is done to check that the cleaning has been successful. The collections then have an estimate of the number of seeds before storage in deep-freeze chambers (-18 to -20°C) within the vault. This process follows international standards. To check the viability of the seed collections a germination test is set up immediately after storage at -20C and repeated at 5, 10 or 20 year intervals. The results of these tests are given to researchers so they will know how to germinate any seeds they are sent. On average, it takes 4 hours 30 mins for all of these processes to be done for one seed collection. What will I receive when I 'Adopt a Seed'? You will receive an email with a link to your full colour, personalised certificate, as a PDF document that you can download and print. If you adopted a seed as a gift, the recipient will receive an email telling them you have adopted a seed as a gift to them. This will be sent to their email address you supplied. If you Save a Species, we will post you an A4 certificate, photograph of your species, and information about the work of the Millennium Seed Bank Partnership. We will also invite you to a special behind the scenes tour of the Millennium Seed Bank (MSB) during which you will have the opportunity to visit the vaults. We'll keep you updated through the year with the work of the Millennium Seed Bank Partnership (MSBP) and at the end of the year, a reminder to renew your adoption. Sorry, but we don't send out any actual seeds They are all safely stored for conservation and research. However, you can visit Kew's Millennium Seed Bank at Wakehurst to learn more about the project. The certificate is full colour, A4 portrait, personalised with the photograph and Latin name of your chosen seed, together with your name. If you adopt a seed as a gift, the name of the recipient is also shown. You can add a personalised message to the certificate as well. 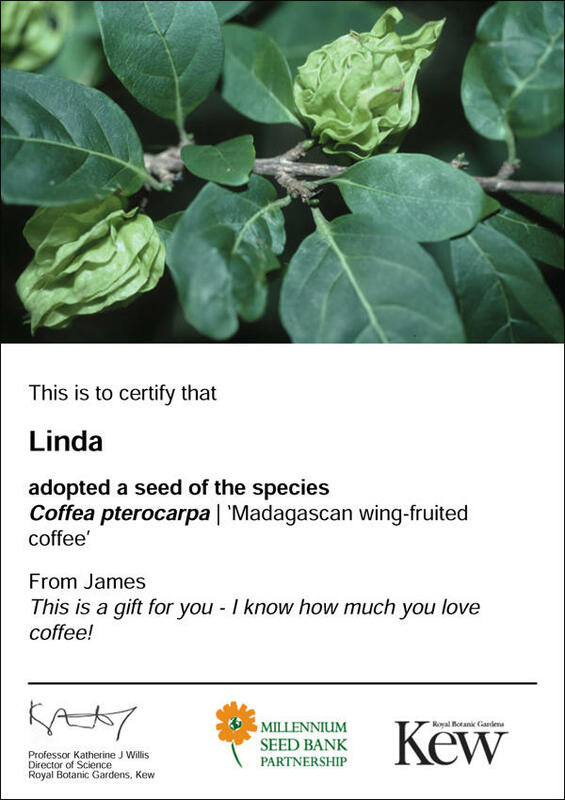 If it is a gift, the recipient will receive an email explaining that you have adopted a seed for them and a link to the certificate (if you supply their email address during the payment process). What if my adoption is a gift for more than one person? Please list all names for the gift in the personalised message so they appear on the certificate. The adoption certificate will be sent to you via email, therefore you can forward it on or print it off as many times as you need. Please get in touch on 020 8332 3248 or adoptaseed@kew.org if you would like to discuss this further.